HASHSLINGER + AGING ENT.... sittin' in a tree. 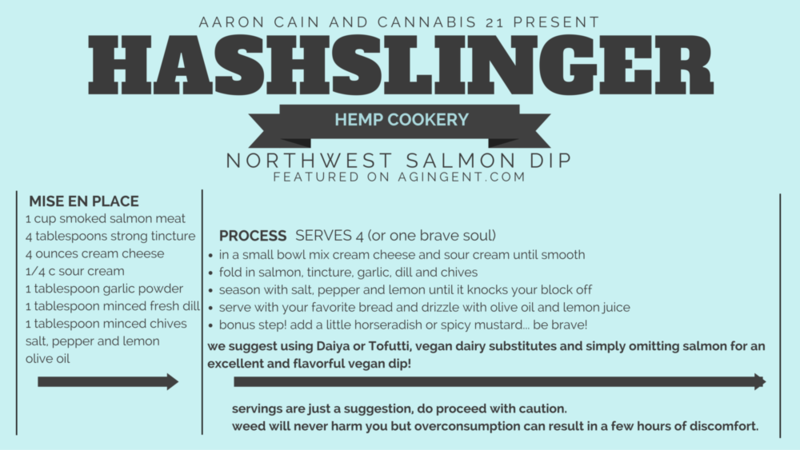 The Saturday before the 50th Super Bowl, Aaron brought the Hashslinger Hemp Cookery and Cannabis 21 on air with the charming and charismatic Marijuana Encyclopedia host Michael AKA The Aging Ent (Aging Ent's Soundcloud) Face to face, mountains of pot, nothing but time and a plate of this very salmon dip we started getting to know one another which actually felt a lot like catching up with an old friend. Before we sparked our first bowl we were already engaged in heavy conversation, as we progressed through a vast array of Cannabis 21's premium flower, hash oils and edibles the topics flowed freely and the haze lowered. An hour in, Michael was still taking pictures of everything. After 5 hours of recording, we had to eventually call it quits but we've got three excellent episodes to share with you all! The biggest thank you to @agingent for such a wonderful experience, we are grateful to call you a friend now! Peanut Sauce and a bonus Pad Thai Recipe!